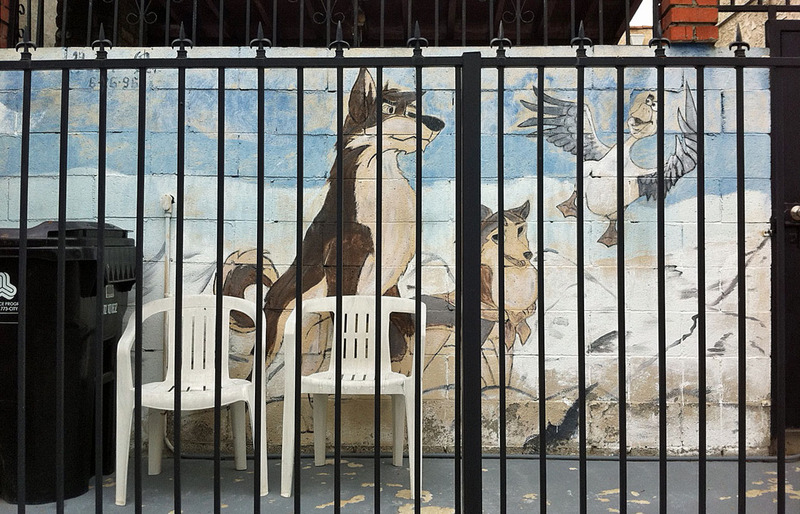 Several years ago on area group forum, one of my neighbors south of Marathon on Occidental Boulevard posted witnessing a crime of some sort (I can’t recall what exactly but it may have been a prowler) in the back of a residence and a respondent asked if it was near “the Balto mural.” Having never seen any such a thing, I’ve been curious about it ever since and many has been the time I’ve been out and about that I’ve looked down some nooks and crannies, including several times down the alley east of Occidental — always unsuccessfully. Though I’d not given up hope of finding it, I’d guessed in the time that had passed it perhaps had been painted over. The main reason for my curiosity didn’t stem from any sort of love of the animated feature loosely based on the real-life dog. It came more from a wonderment as to why and how would a mural about the heroic canine (who has a statue in New York’s Central Park) come to be painted in my section of Silver Lake — and essentially hidden from view by anyone except those residents (and/or prowlers) who might utilize the alley. In the upper left section of the frame (above the trashcan and near the top of the wall) the date 6-6-96 of its creation is visible through the fence posts. But thanks to my excellent framing skills, I’ve perfectly obscured the name above the date behind the crossbar. With the resemblance to the animated characters being spot on, could it be the work of an animator from the movie, which was produced by Steven Spielberg’s pre-Dreamworks Amblimation studio? Or was it just a labor of love 15 years ago by a fan? I’ll have to go back and catch the artist’s name to see if that will reveal anything. Balto was not destined to be a star in the breeding shed since he was neutered at a young age, hence he was relegated to being neglected on the vaudeville circuit with his team. While visiting Los Angeles, George Kimble, a former prize fighter turned businessman from Cleveland, was shocked to discover the dogs were unhealthy and badly treated. Mr. Kimble worked together with the newspaper, The Plain Dealer, to bring Balto and his team to Cleveland, Ohio. On March 19, 1927, Balto and six companions were brought to Cleveland and given a hero’s welcome in a triumphant parade. The dogs were then taken to the Brookside Zoo (now the Cleveland Metroparks Zoo). Balto died at the age of 14 in 1933. His remains were mounted by a taxidermist and remain on display at the Cleveland Museum of Natural History. This entry was posted on Tuesday, May 24th, 2011 at 9:05 am and is filed under art, neighborhood. You can follow any responses to this entry through the RSS 2.0 feed. Both comments and pings are currently closed.